Many people do not know that Crown Center is a veritable theme park of late Mid-century Modern designs done by the Starchitects of the day. Think about this complex of heroic buildings designed by Welton Becket, Edward Larrabee Barnes, Alexander Girard, Dan Kiley, The Architects Collaborative (TAC), Harry Weese, Office of Mies Van der Rohe and I. M. Pei. The Crown Center complex was a 1970s mixed-use complex done at an Urban scale for the Hall family, owners of Hallmark Co.
Warren Platner was an architect and designer for Eero Saarinen and his successor firm Roche & Dinkaloo. He is known to have been very influential on the Interiors of such buildings as the John Deere Administration Center and the CBS building in NYC. Platner is probably most known for his collection of wire furniture designed for Knoll that he did after leaving Roche Dinkeloo. 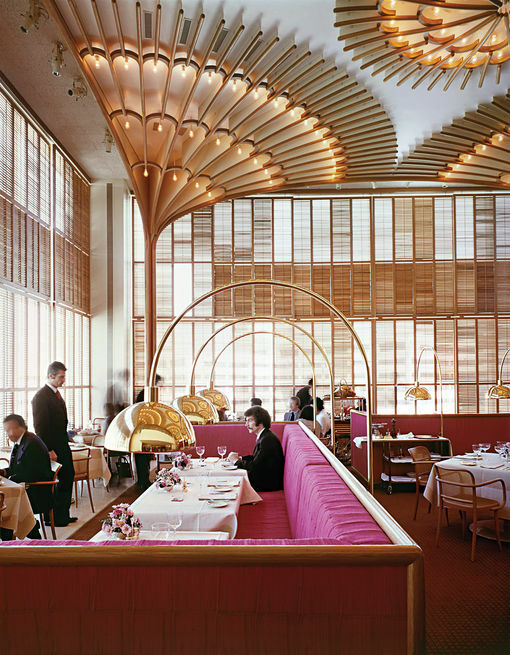 Because of his later experience with his own firm, Warren Platner Associates, designing prestigious restaurants such as New York's, Windows on the World and Chicago's, Water Tower Place, he was hired in 1974 to design the interior of the American Restaurant as a jewel in the crown of Crown Center in Kansas City, Missouri. The exterior of the building was designed by well-known architect Edward Larrabee Barnes who master planned the entire Crown Center district. The resulting space is an exercise in modern fan vaults that act as diffusers for lighting. The wood shutters warm up the heroic modern box that surrounds the restaurant. 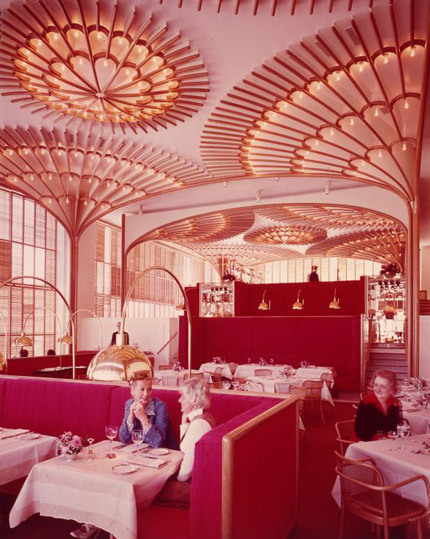 Platner himself described the bentwood, brass and lipstick-red interior as "like a huge lace valentine." This seems like an appropriate image for a space designed for the owners of Hallmark Cards. The restaurant was featured in Platner's book, Ten By Warren Platner.